Amar, a 12-yr-old orphan, works in a hotel, and at night, studies at Masterjis school. Kalinath, a pimp, murders one of his customers, and the innocent Amar is convicted instead of Kalinath. 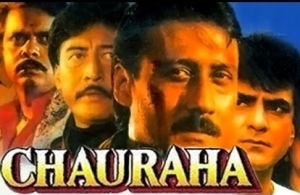 After many years, Amar (Jackie Shroff) returns, after completing his sentence, and finds everything changed. The school had made way for a gamble-house. He comes to know that Kalinath is dead and his son Baba Bhatti (Danny Denzongpa) is one of the leading criminals. Amar brings the crooks to book, and the gambling house now makes way for ‘Insaaf Ghar’. Amar falls in love with Poonam (Ashwini Bhave), an honest Inspector Kailash Mathur’s (Jeetendra) sister. Amar comes across a poster of Badrinath, who is contesting the elections. He identifies him instantly, he is the pimp Kalinath, Amar and his friends Kidnap Kalinath, alias Badrinath, two days before the elections. What happens next?